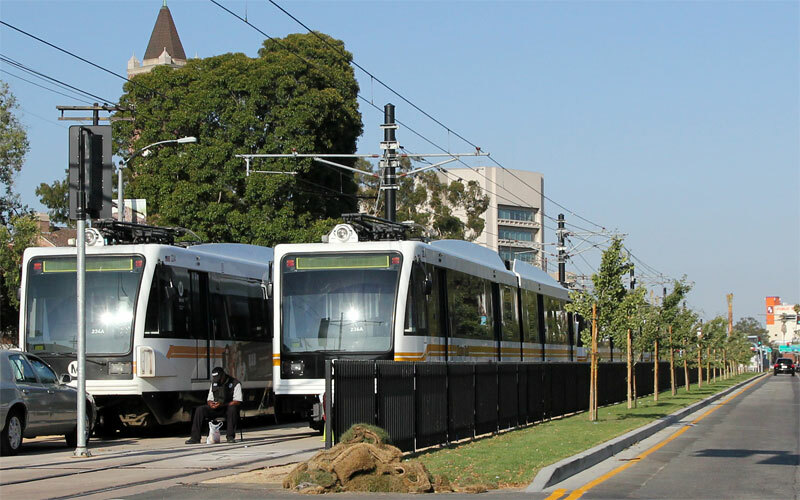 11/23/11 — Metro's The Source posted this video of riding from Jefferson to Trousdale. 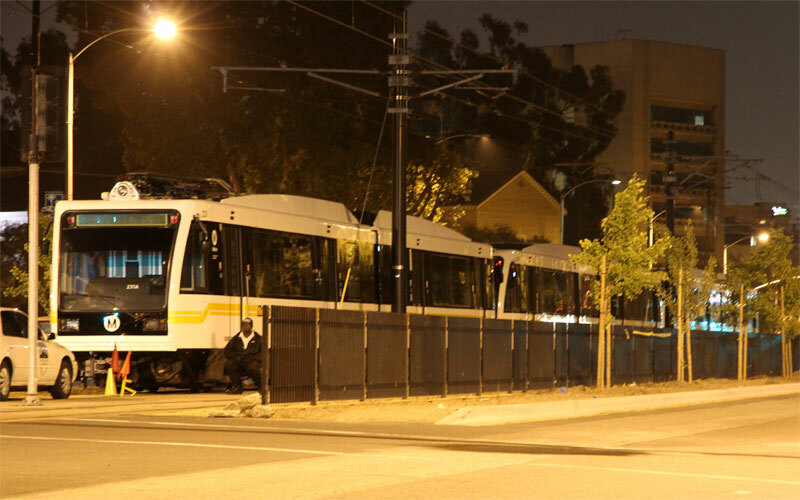 7/27/11 — Sod has brought the median strips by USC back to something similar to the former landscaping, only now with two three-car light rail trains. 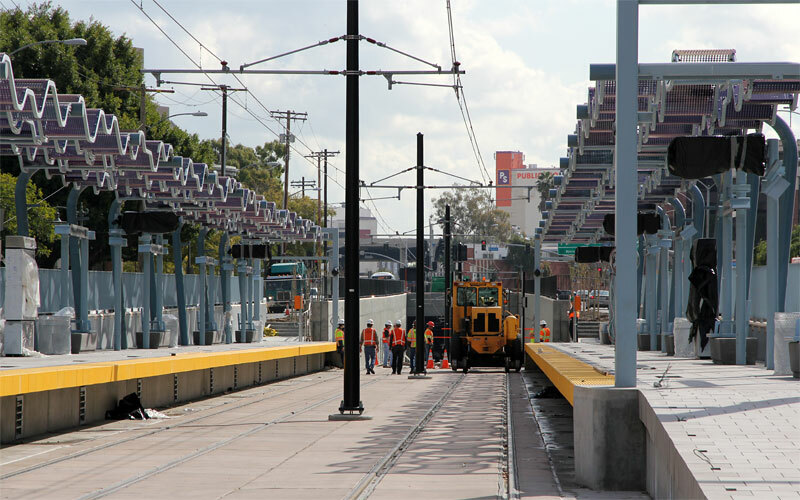 5/18/11 — The test train is now three cars long, all gleaming in new paint! 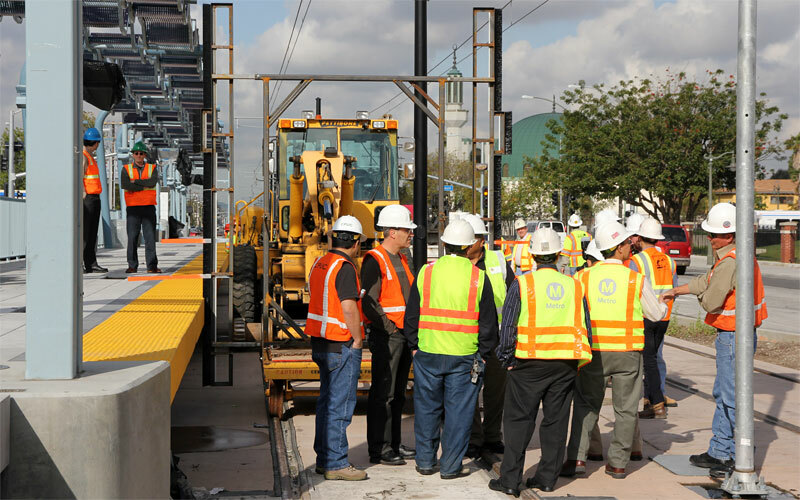 3/22/11 — Clearance envelope testing began today at the Vermont station, then proceeded east to the USC station and into the underpass. "The vehicle mock-up will have flexible feelers around the outline protruding three inches beyond the vehicle silhouette. ... Clearance silhouette representing passenger vehicle dynamic envelope passes through entire area being tested without encountering any interferences. 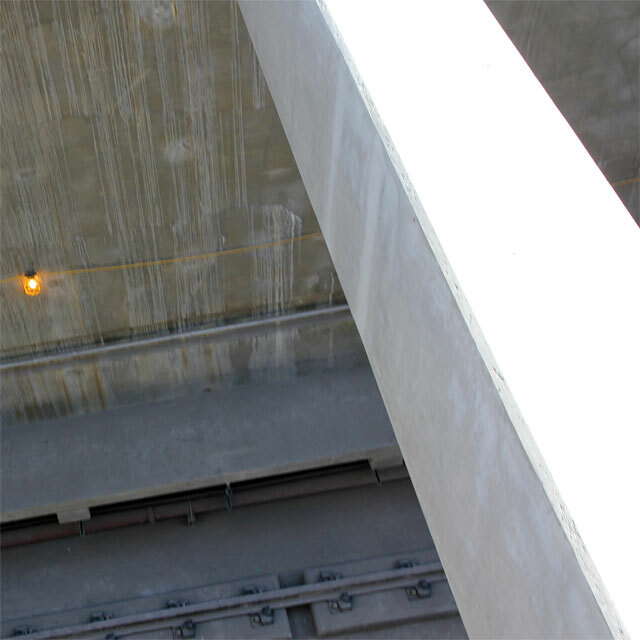 Measurements taken between station platform edges and mock-up silhouette do not exceed three inches. "Per PUC General Order 143-B: Section 9.06 Clearances. ... c. On station platforms, in yards and along shop aisles, and other locations, including emergency walkways, where passengers, employees, or other persons are permitted or required to be while trains are in motion, the minimum clearance shall be thirty (30) inches; ... 2. at locations and in areas where passengers, employees, and other persons are normally prohibited while trains are in motion, the minimum clearance shall be eighteen (18) inches." 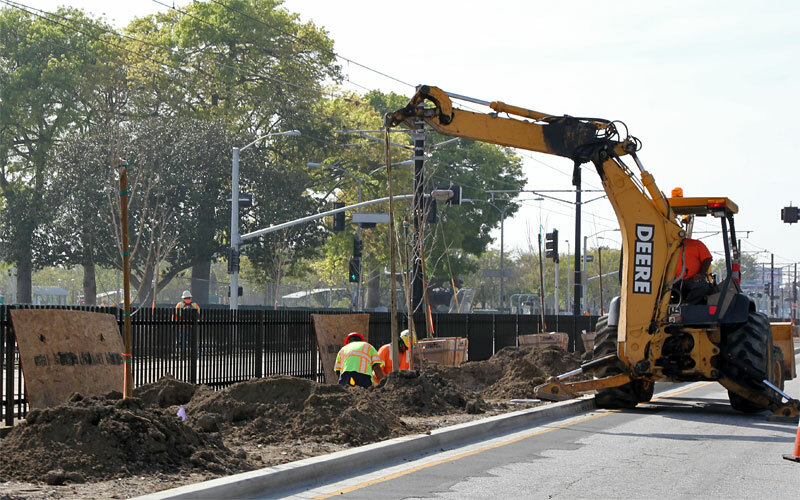 3/4/11 — Trees are being planted between USC and Exposition Park! 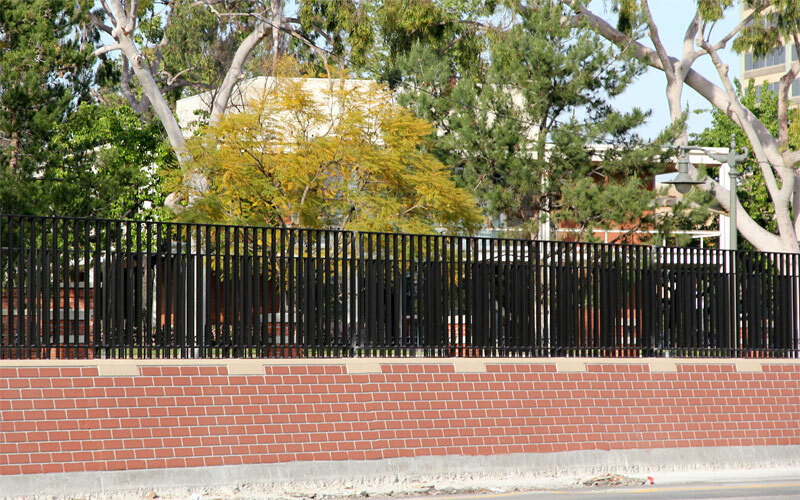 12/9/10 — Mulch is being sprayed onto the planter east of Trousdale. 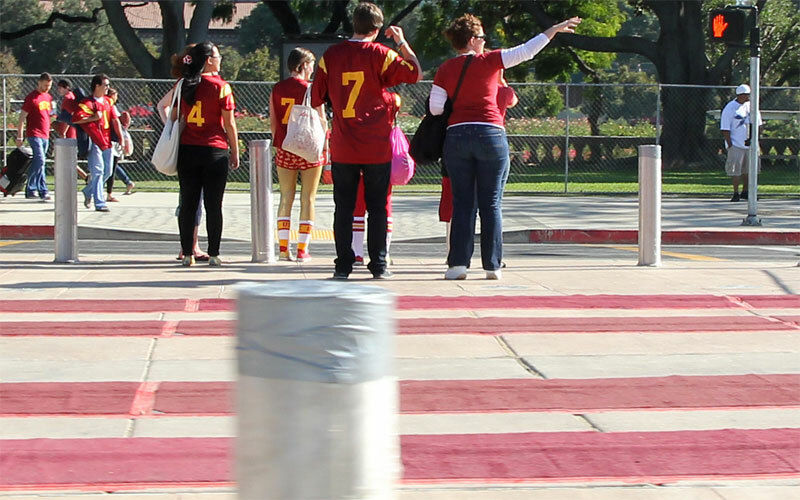 11/2/10 — OCS crossarms are mounted on the poles between Flower / 30th and Trousdale (above), as they are from La Brea west. 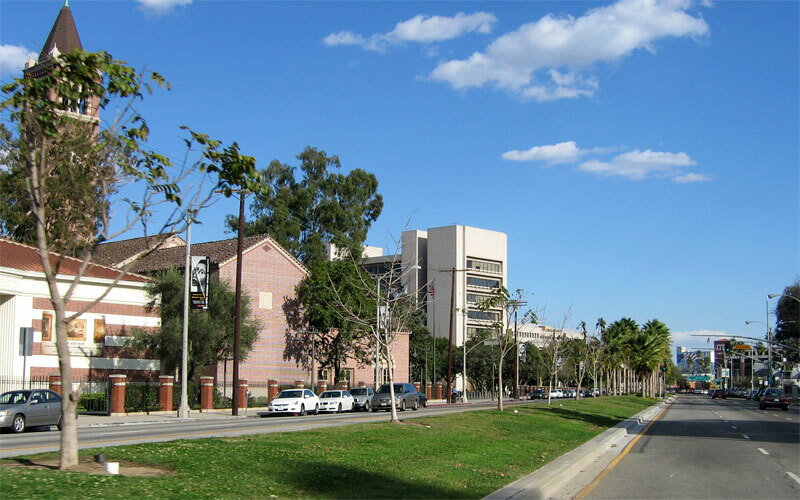 Below is a view between Watt and Trousdale, looking complete except for landscaping. 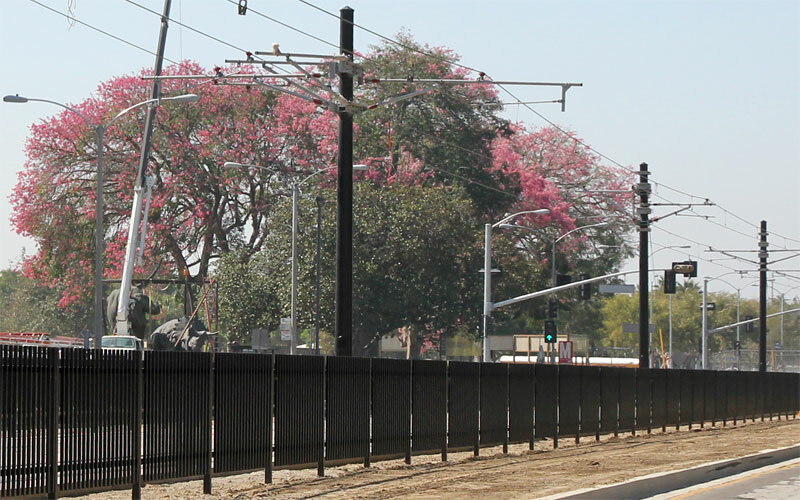 10/12/10 — Fencing is finished in front of USC, with blooming silk floss trees across the street in Exposition Park. The crane on the left is moving the dinosaur statues for the Natural History Museum construction. 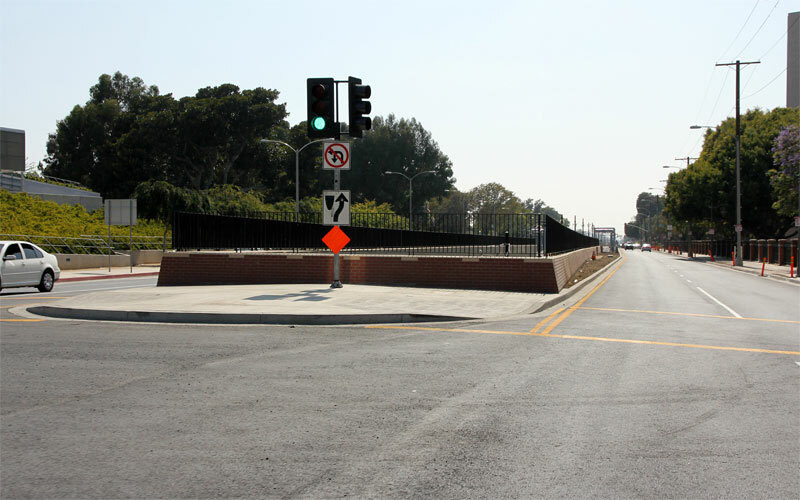 9/11/10 — The Trousdale crossing is open for the first USC football game of the season. 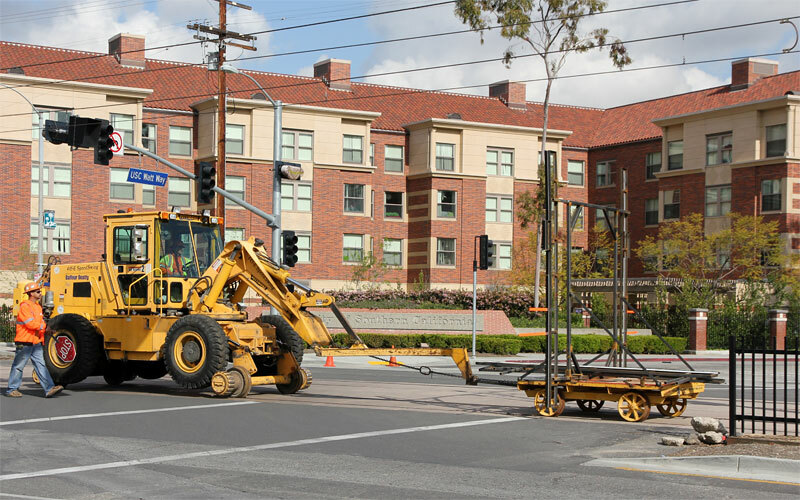 9/2/10 — Paving is completed for the Trousdale pedestrian crossing, getting ready for the first fall USC football game. 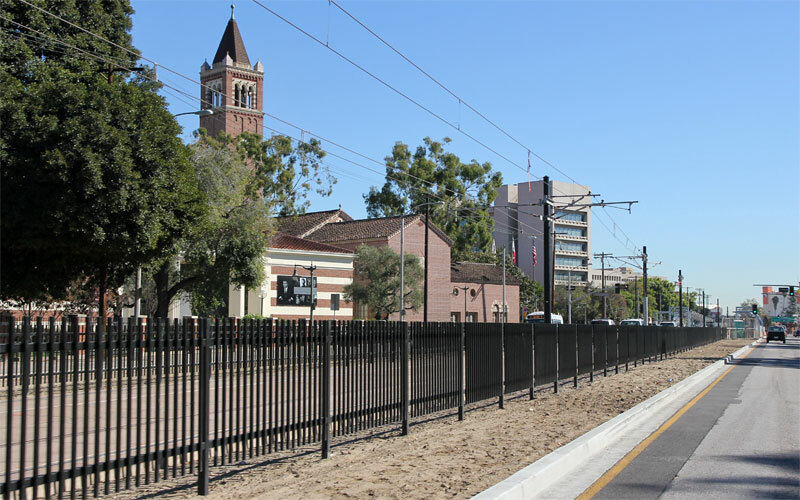 8/27/10 — Black fence posts have appeared in front of USC; compare with the simulation below. 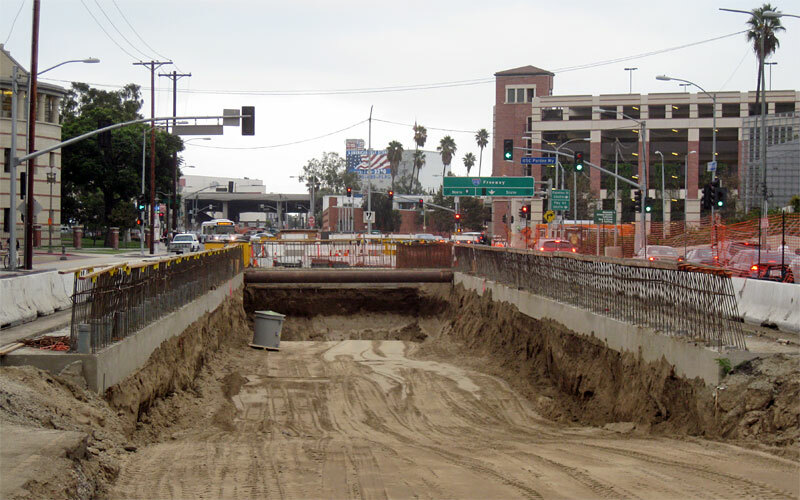 8/20/10 — A quick snap through the railing into the trench, west of Figueroa. 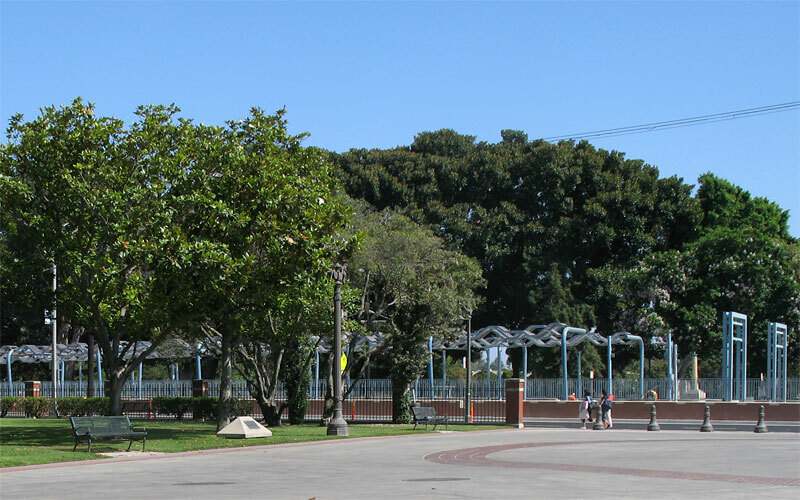 8/6/10 — Here's a counterpoint view from Exposition Park toward USC. 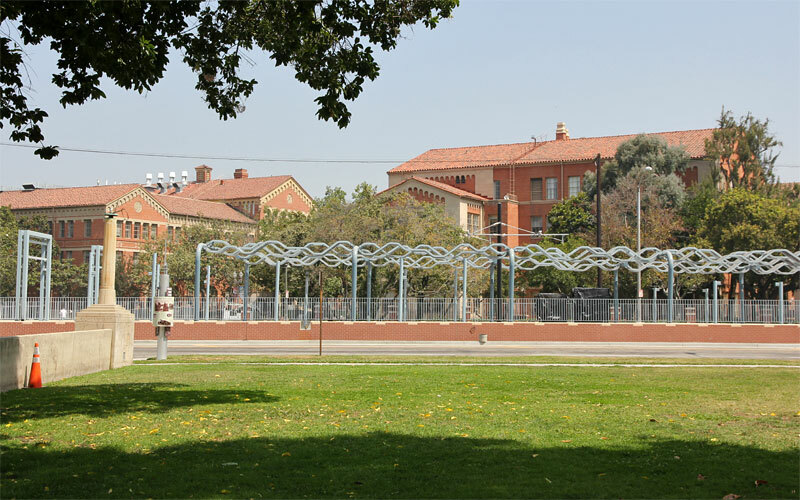 7/9/10 — The USC station is looking very nice in its setting between the campus and Exposition Park! 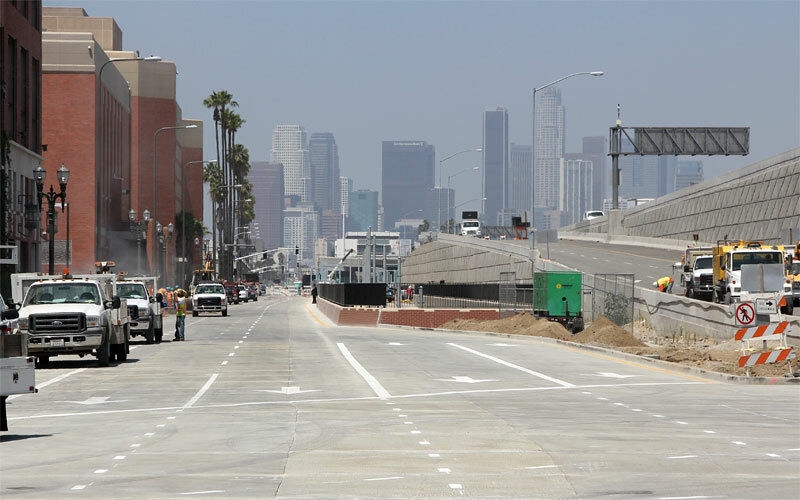 6/27/10 — Exposition Blvd. 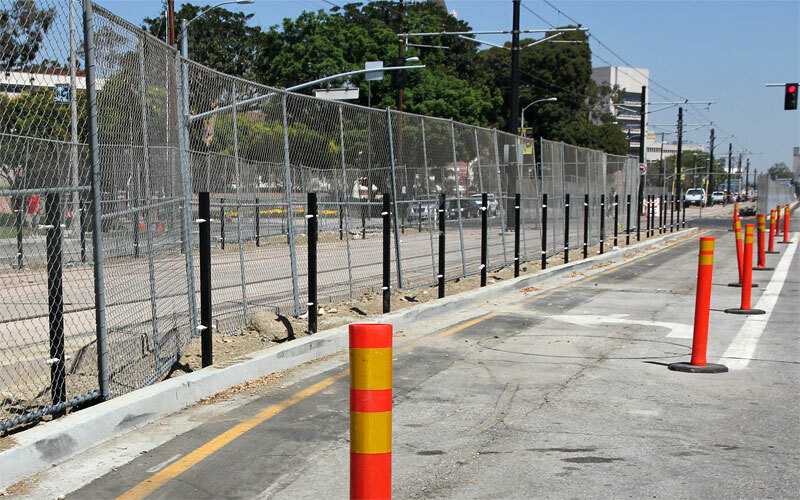 west of Flower Street has been repaved and the construction fencing is gone. 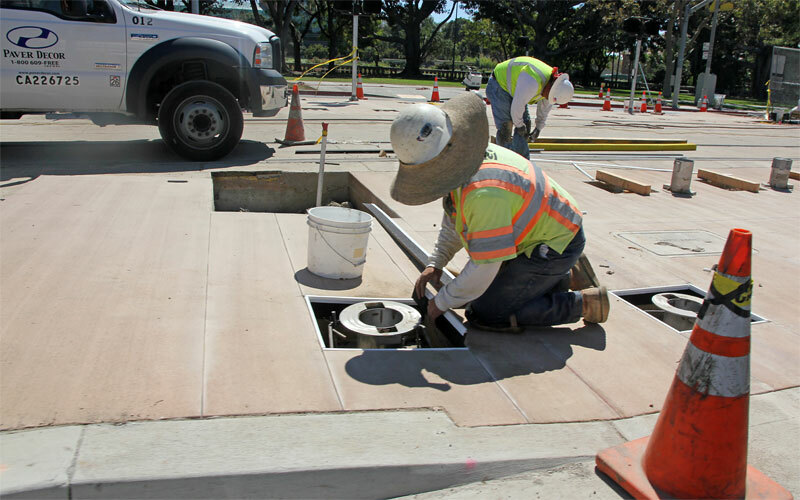 6/4/10  Flower and Exposition have been closed for new concrete paving on Flower south of Jefferson. 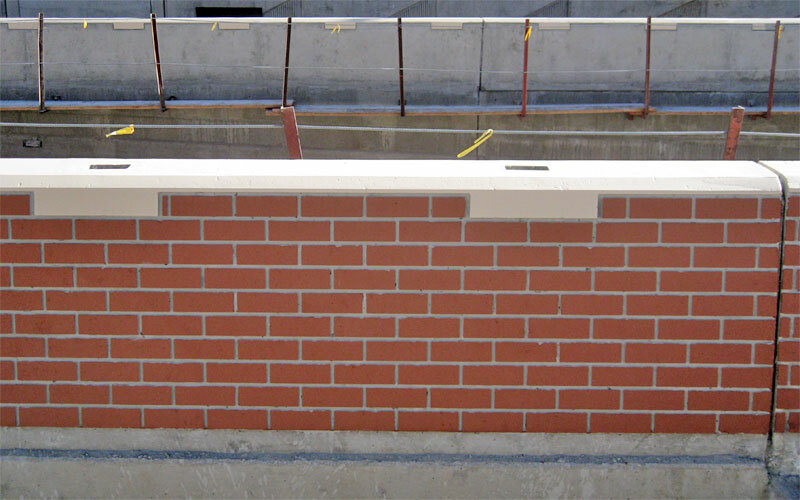 There don't seem to be curbs added along the brick-pattern parapet walls. Exposition Blvd. 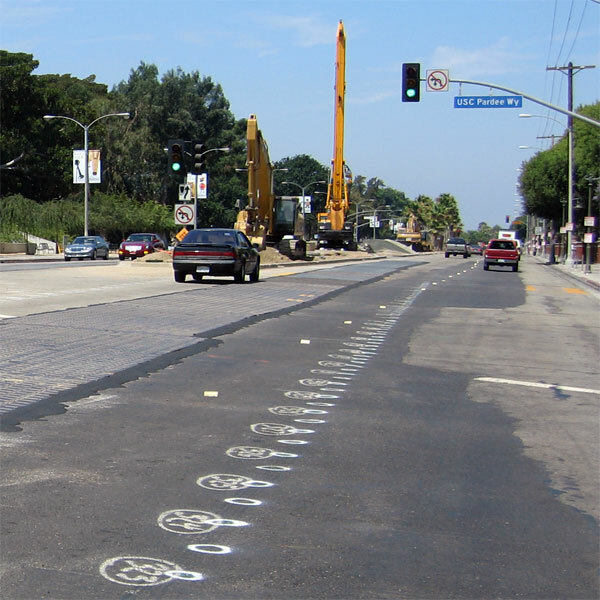 from Figueroa to Vermont will be repaved next. 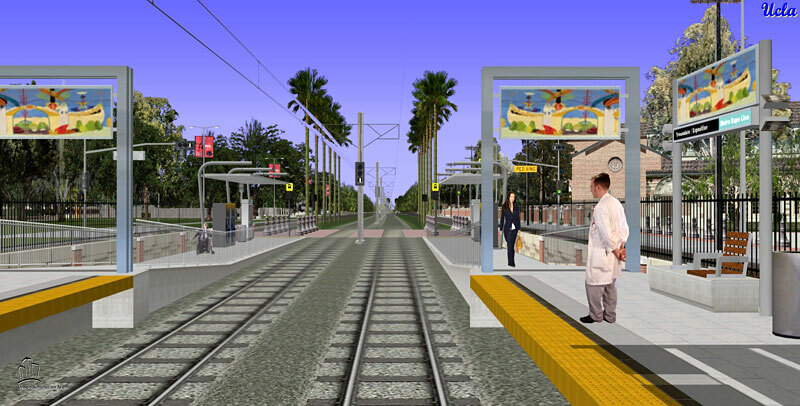 4/15/10  The USC-Trousdale station has its yellow platform edge tiles, and it looks like the K-rails will be gone soon. Note the sun shining on the canopies. 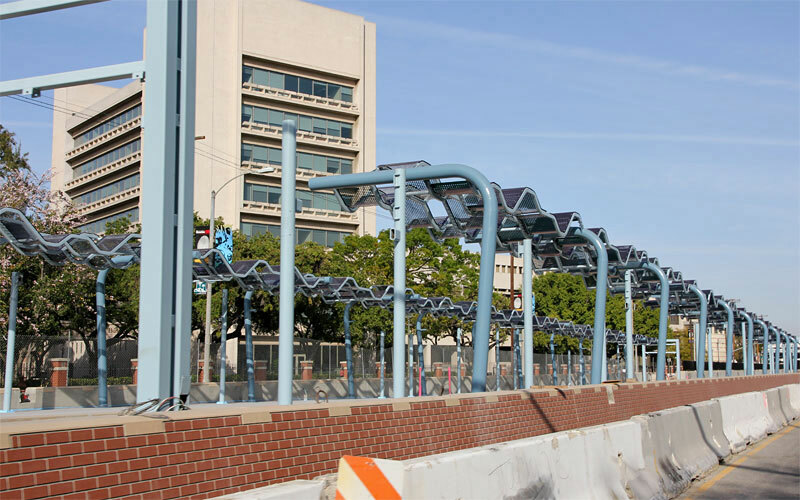 3/20/10  The USC-Exposition Park station looks relatively close to its finished form, above (compare with the simulation). Below is how the brick-pattern parapet wall and metal railing above the underpass west of Flower St. looks with the K-rails newly removed. 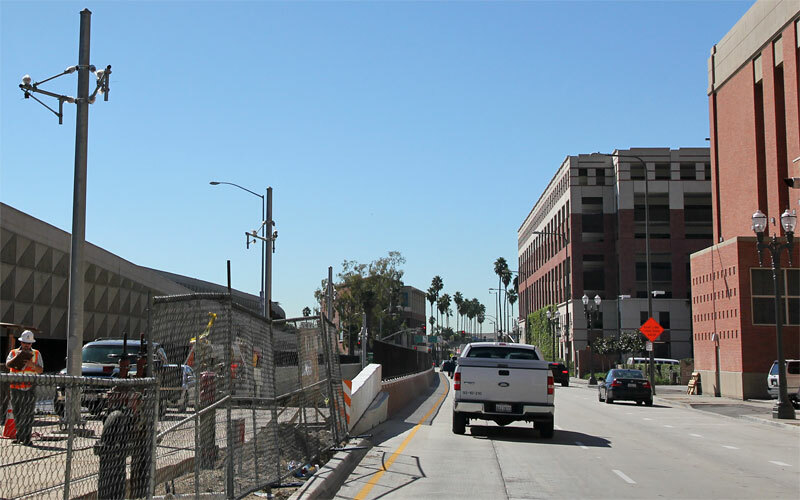 2/7/10  Tracks from the underpass and up Flower Street are nearing completion, seen on a beautiful Los Angeles winter day. 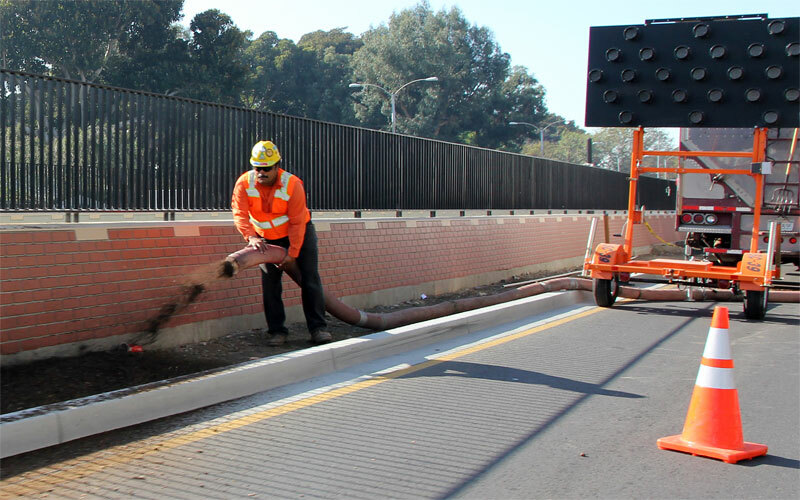 12/18/09  The parapet wall along the underpass was cast with a brick pattern and is being painted a brick-red color. 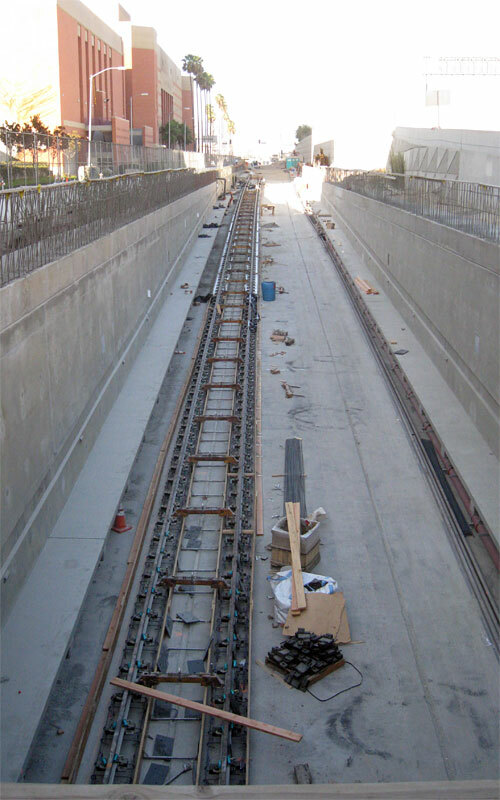 11/12/09  This Expo Authority photo of the finished rails in the underpass is from this month's Expo board presentation. 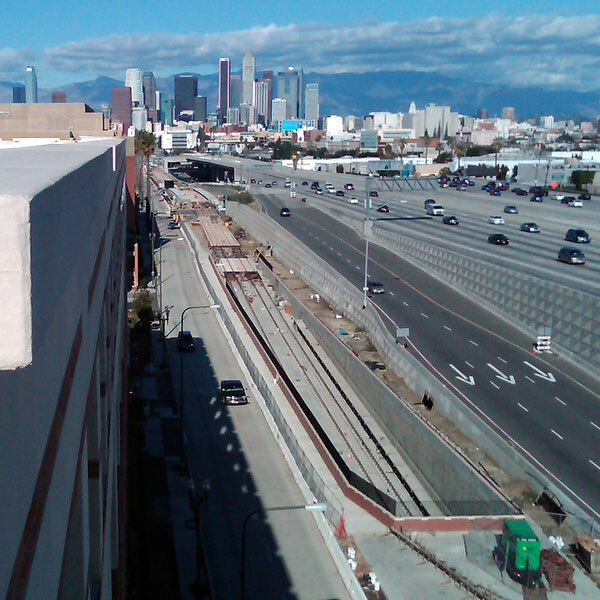 It appears to be looking east from under just east of Figueroa, with the curve north to Flower in the distance. 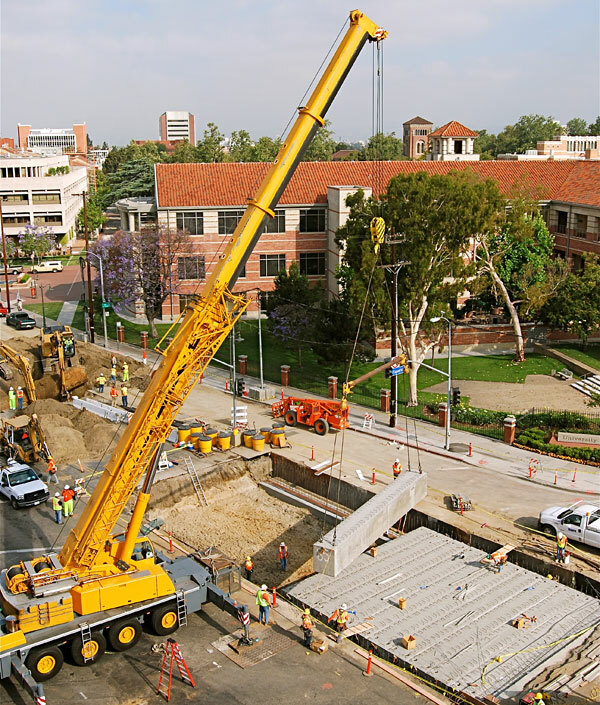 10/24/09  The station platforms at Trousdale are nearing completion, seen here on a USC football day. 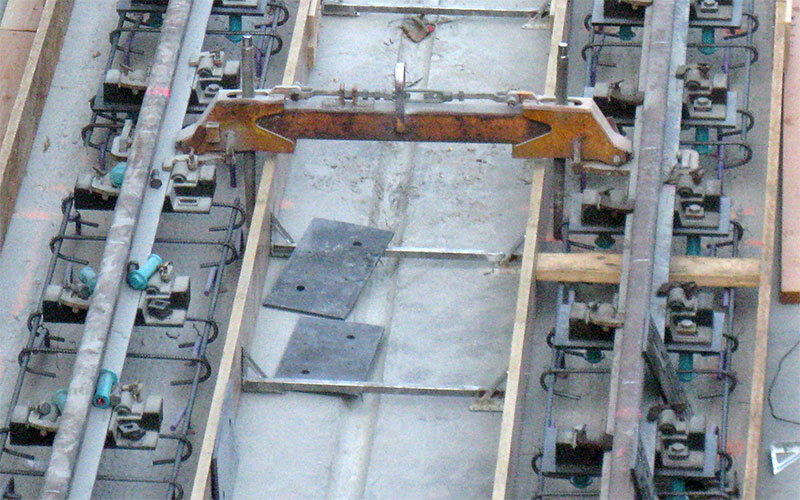 9/20/09  Rails are being installed on the Flower Street ramp of the underpass (detail below). 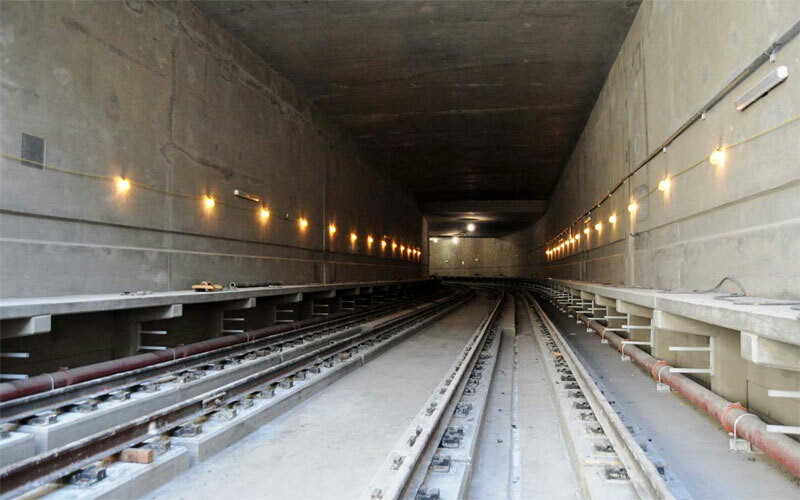 You can also see the emergency catwalk on the sides and a bit of the fire pipe beneath. 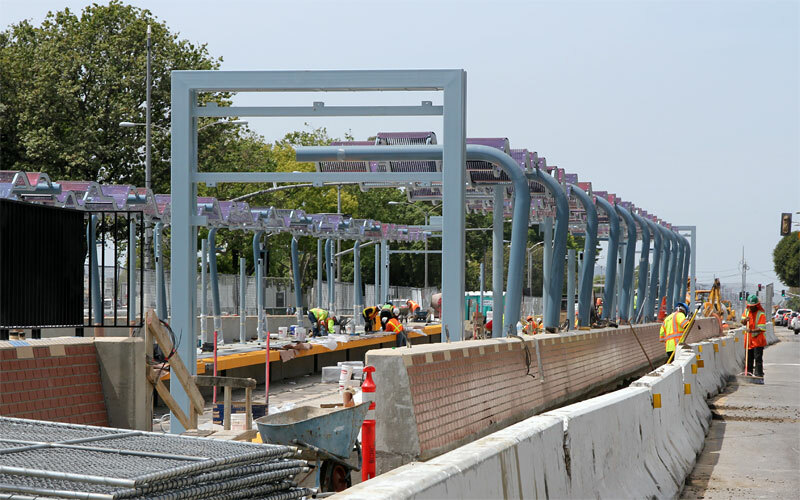 8/19/09  This new Expo Authority copyrighted photo shows the underpass nearly finished. 7/3/09  Looking west from Pardee Way the trench walls are finished on this end of the underpass (above), and partly done on the Flower Street end. 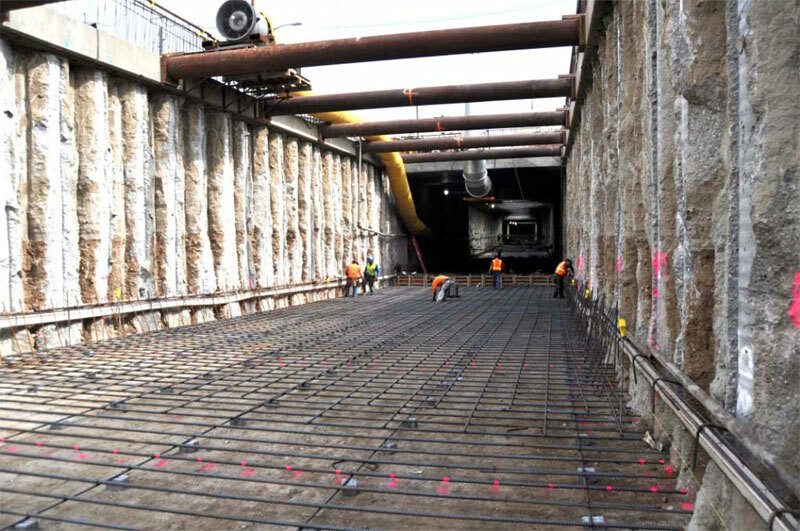 Looking east from Trousdale you can see rebar where the south-side station platform will be (below). 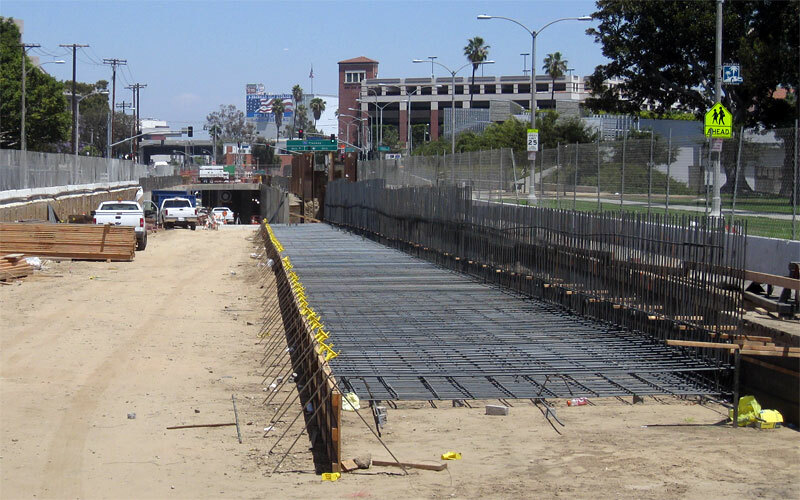 5/29/09  Rebar is up for the underpass walls, looking west from about Figueroa (Expo Authority copyrighted photo). 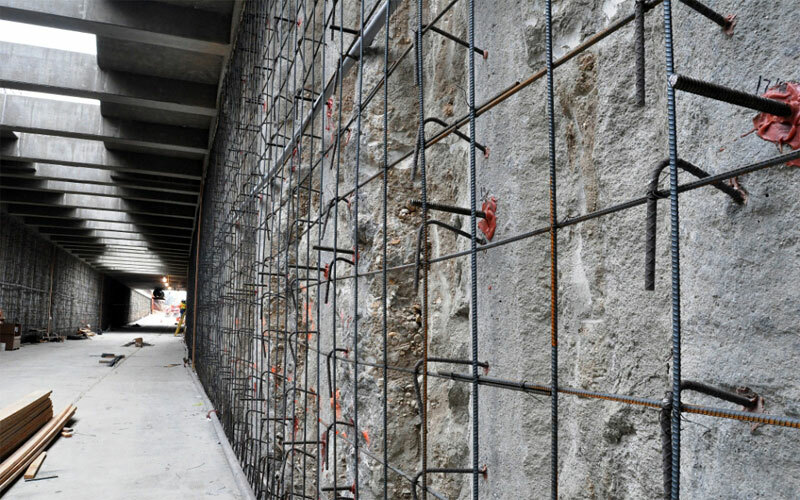 5/17/09  Closer up, the slab is in place awaiting finished walls to cover the exposed CIDH piles along the north ramp on Flower. 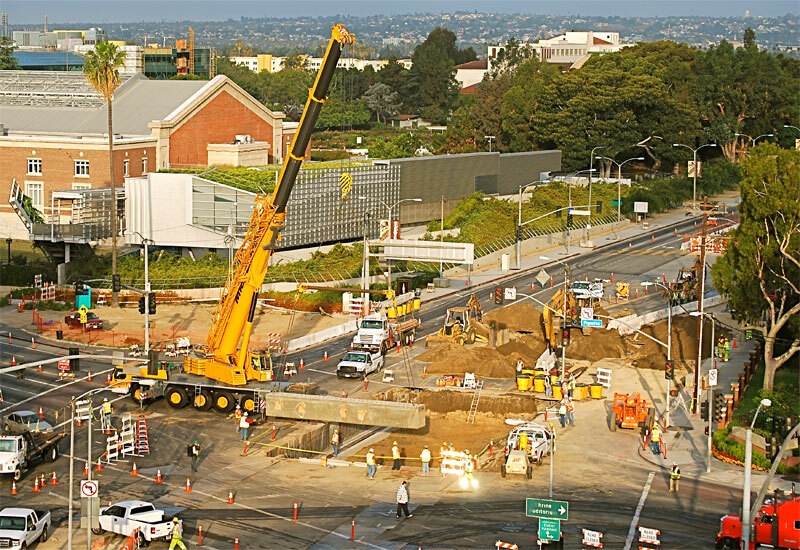 5/13/09  This aerial view of the Flower Street ramp shows progress on the slab and route north. 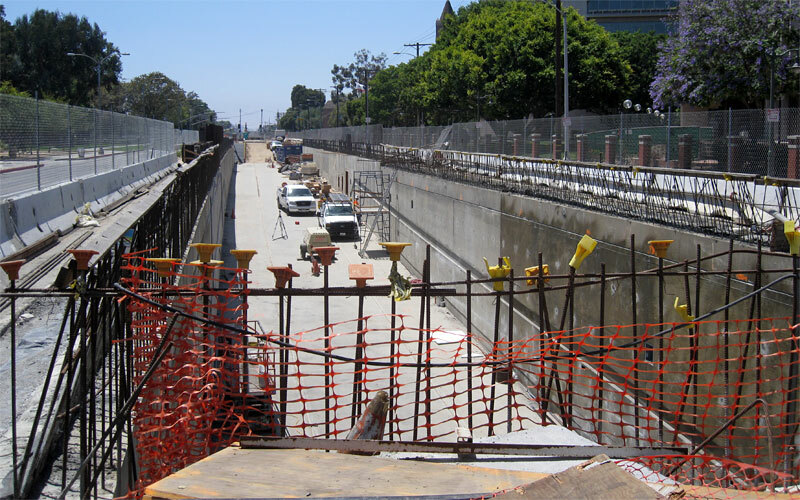 5/12/09  The westbound USC station platform is outlined on the near left in this view east from Trousdale Parkway toward the underpass. 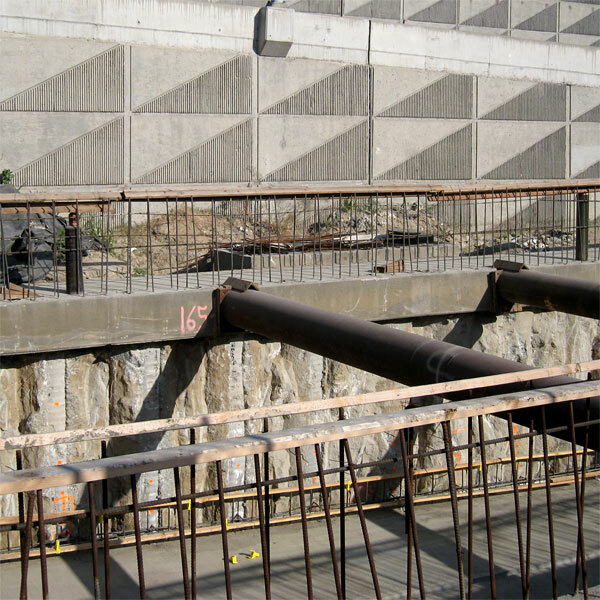 1/9/09  Rebar is nearly ready for the invert slab bottom of the underpass (Expo Authority copyrighted photo). 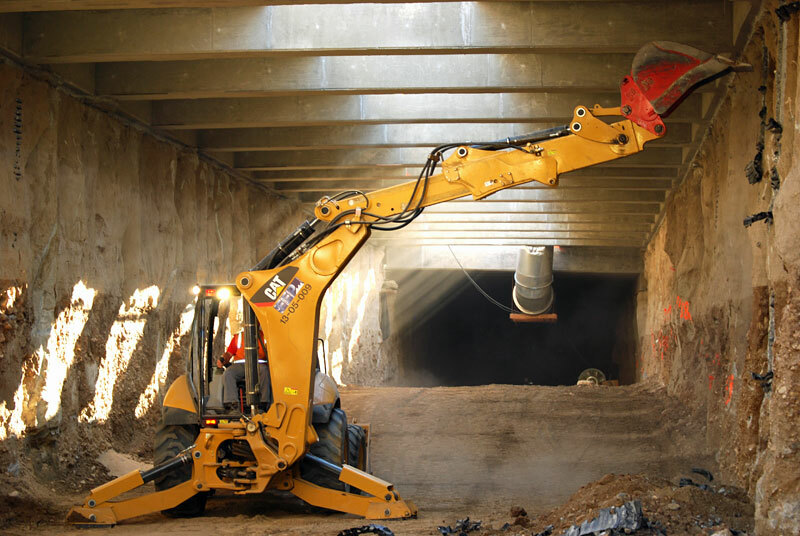 10/8/08  Excavation continues in the underpass (Expo Authority copyrighted photo). 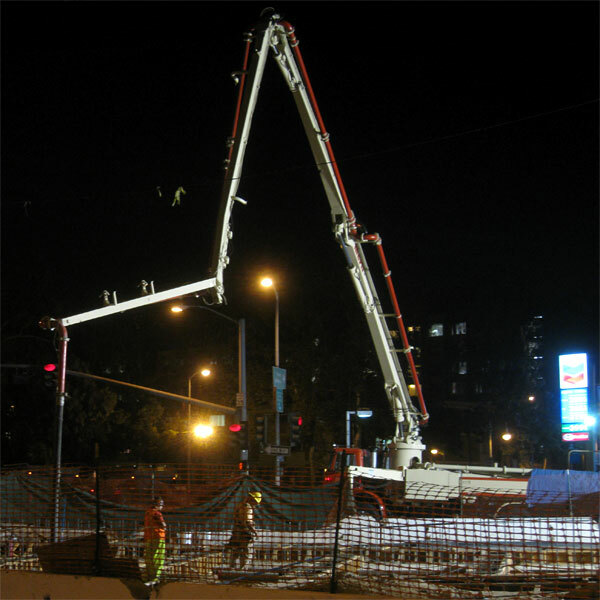 10/2/08  Concrete is poured at night for the cast-in-place beams east of Figueroa. 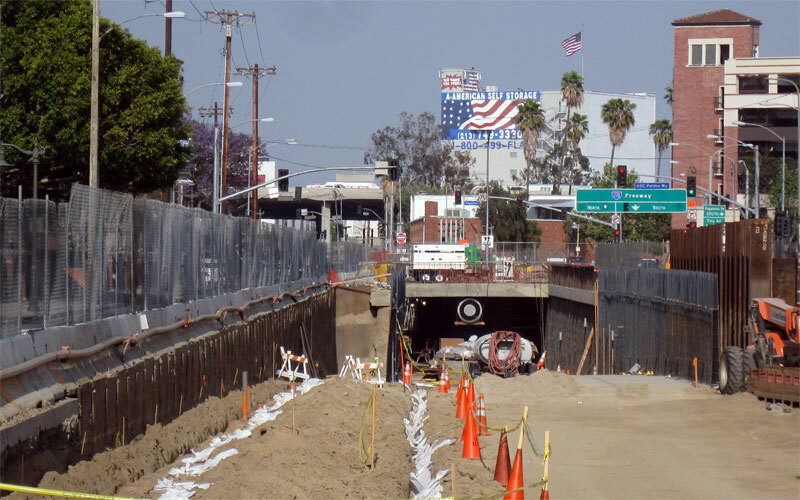 9/11/08  Cast-in-place beams are completed west of Figueroa (above), and excavation is beginning at the west portal (below). 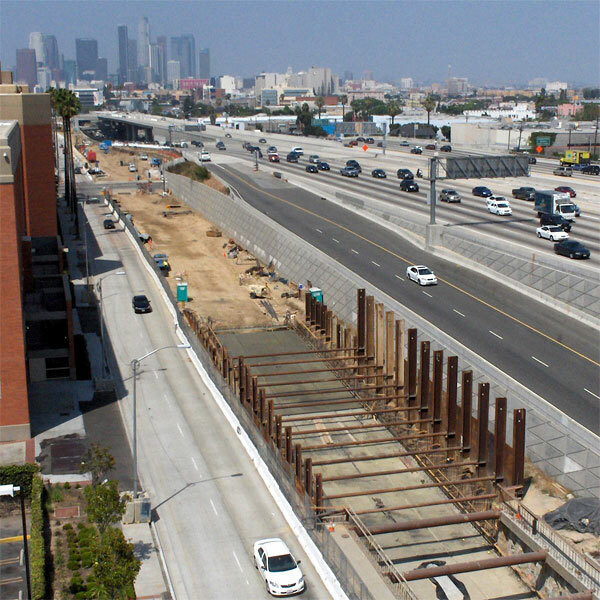 7/30/08  Other sections used cast-in-place open beams and solid decking, CIDH rebar ends are awaiting a cast-in-place beams here east of Figueroa. 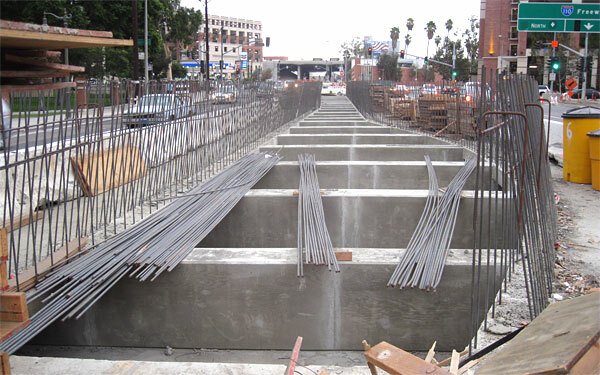 Forms and rebar are being installed for the cast-in-place beams in the median west of Figueroa (below). 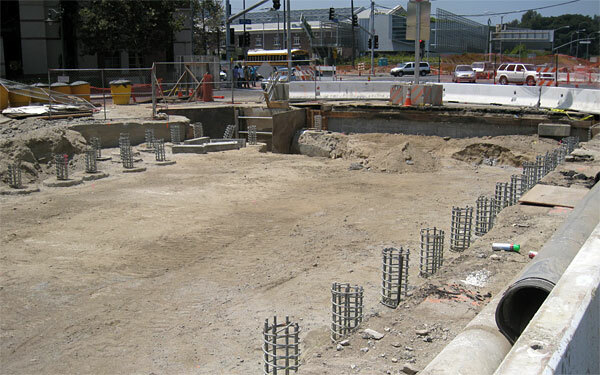 5/31/08  With the CIDH piles in place, but the trench not yet excavated, to limit street closure precast concrete beams were installed during weekends at Figueroa (these photos), Flower, and Pardee Way (Expo Authority copyrighted photos). 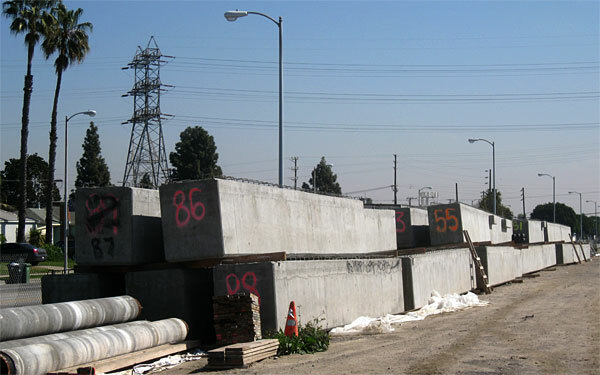 2/28/08  Precast concrete girders are staged on the right-of-way east of La Cienega. 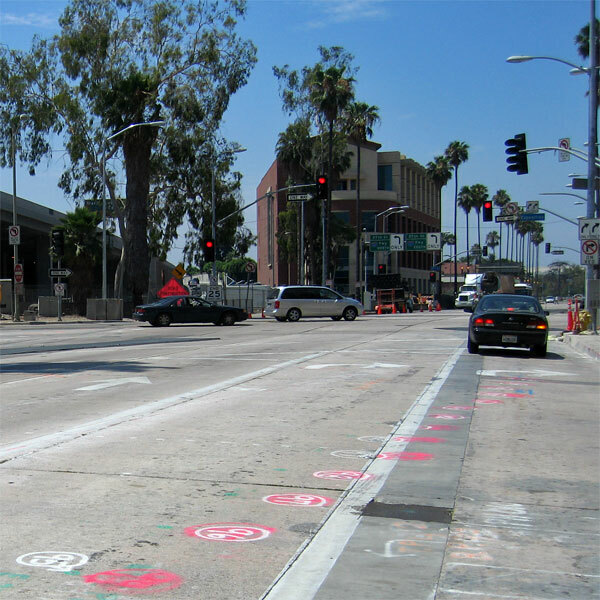 7/24/07  Following utility relocations (covered by steel plates), underpass construction began with marking CIDH (Cast In Drilled Hole) locations to be drilled on Flower Street (looking south, above) and Exposition Boulevard (looking west, below). 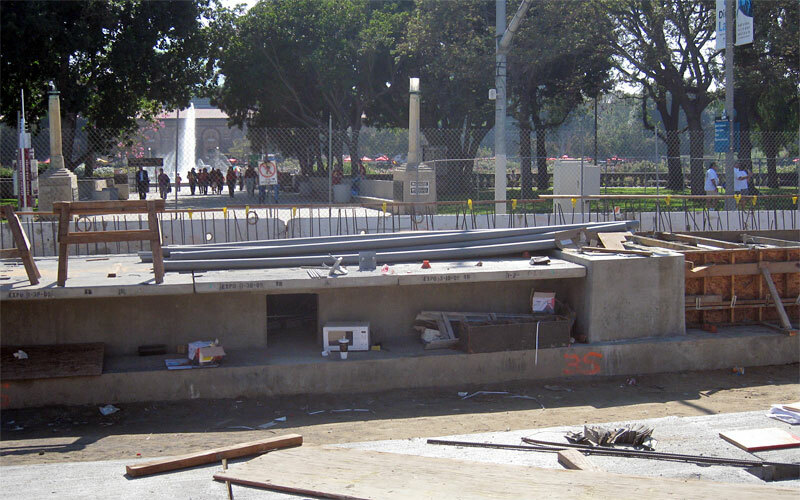 1/12/07 — A last view of the old landscaped median between USC and Exposition Park before construction begins. 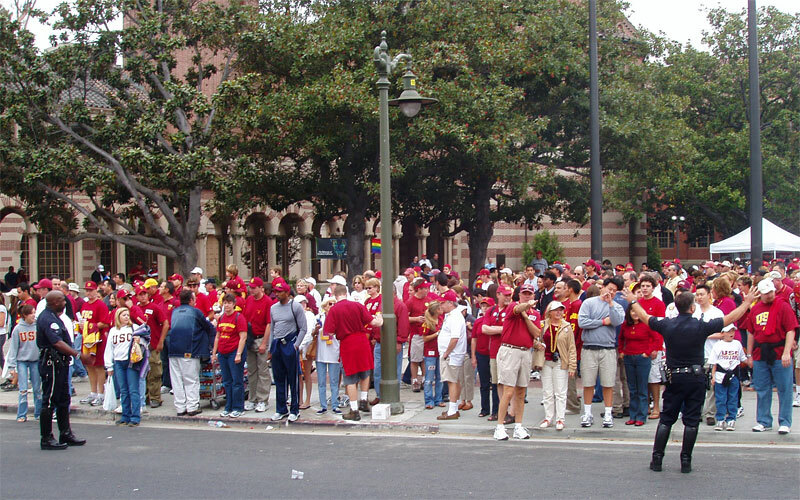 10/14/04 — USC football fans crossing Exposition Blvd. at Trousdale. 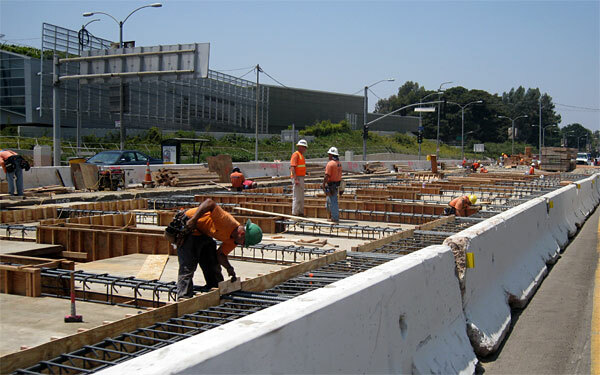 The underpass below Flower Street, the I-110 freeway offramp, Exposition Boulevard, Figueroa Street, and Pardee Way was required to grade-separate these complex intersections. 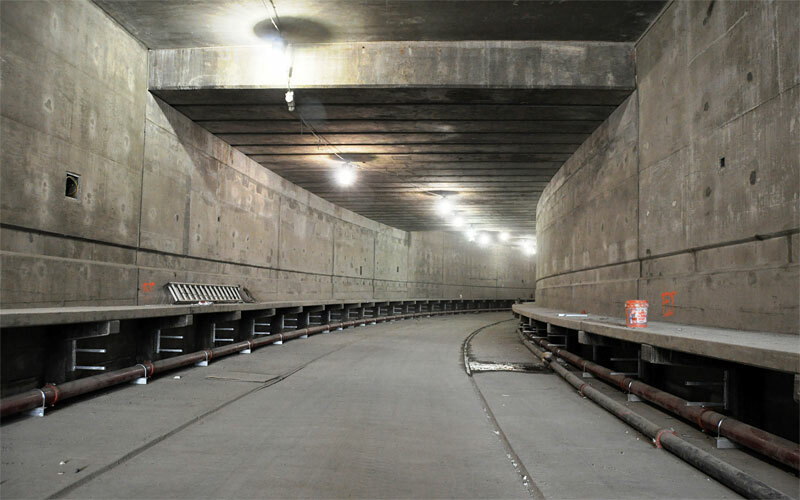 It is about 1/4 mile long between portals (1/2 mile long including ramps and the USC station), 25 feet deep, and will have taken over two years to build (profile below from Final EIS/EIR, Appendix A, pdf pages 58-60). 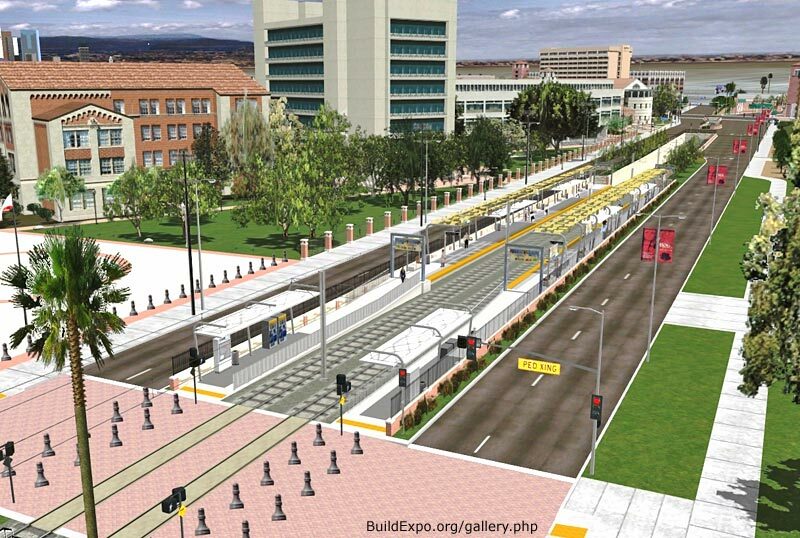 Above is an Expo Authority image of the USC-Exposition Park station at Trousdale. 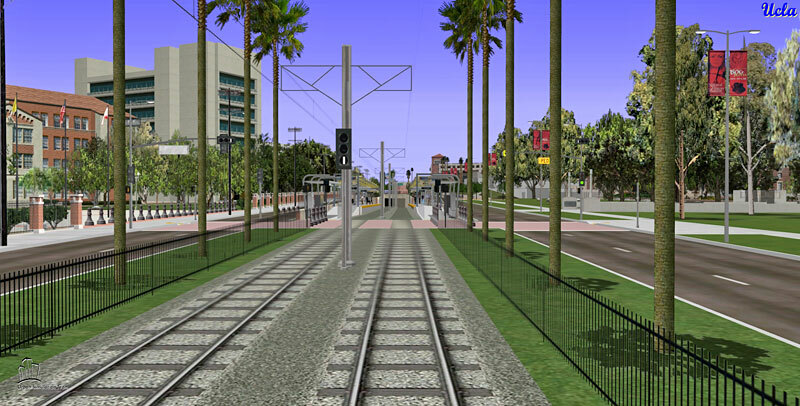 These Expo Authority simulations show the view looking east (above) and west (below) across Trousdale. 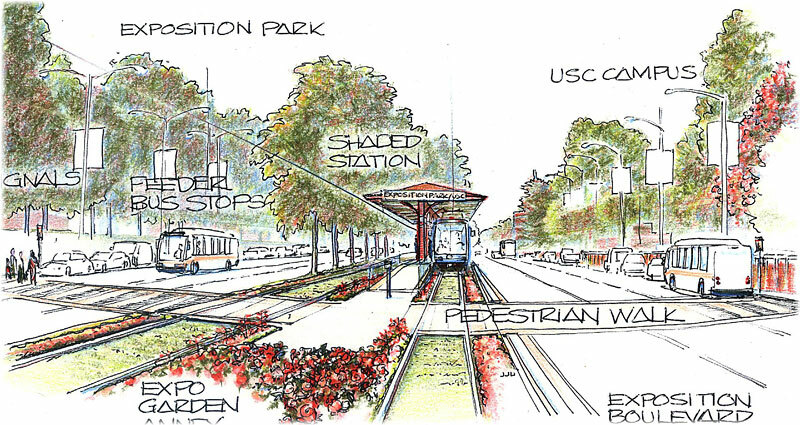 3/01  Friends 4 Expo concept sketch at Trousdale between USC and Exposition Park.